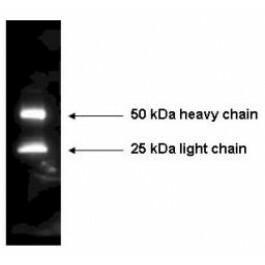 Product is tested for Frozen Sections, Western blot / Immunoblot, Enzyme Immunoassay. Farr & Nakane, J. Immunol. Methods 47; 129-144. 1981. (Conjugation). Sone H, Kagawa Y. Pancreatic beta cell senescence contributes to the pathogenesis of type 2 diabetes in high-fat diet-induced diabetic mice. Diabetologia. 2005 Jan;48(1):58-67. Epub 2004 Dec 29. PubMed PMID: 15624098. For extended storage aliquot and freeze at -20°C or below. Avoid cycles of freezing and thawing! Dilute only prior to immediate use! 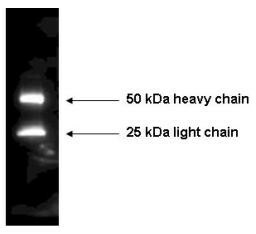 Assay by immunoelectrophoresis resulted in a single precipitin arc against anti-Peroxidase, anti-Rabbit Serum, Mouse IgG and Mouse Serum.